July 20, 2012 / P.J. 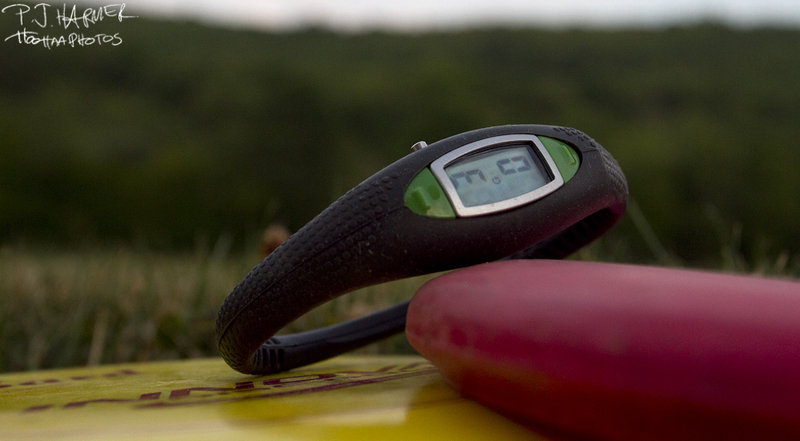 The ScoreBand is a worth addition to any disc golfers bag. (Editor’s note: Two people associated with Rattling Chains tested out ScoreBand, a scoring watch that also works for tennis and other things. The first part is by P.J. Harmer). No matter what I do, statistics fascinate me. Whether it’s softball or finds in geocaching or comparing scores on the disc golf course, I really get into it. One thing with disc golf and me has always been keeping the score. Though there are many phone apps or pencil-and-paper ways of keeping score, I’ve been in search of a quick and easy way of keeping score as I play a round without fumbling with my phone or a pencil. ScoreBand is a rubber wristband/watch. The company calls it a “revolutionary quick-touch, 4-in-1 scorekeeping wristband engineered for sport.” It stood up to the challenge, too. First, the construction is a one-piece rubber wristband. There are several sizes and colors to choose from, so you’ll be able to find one (or more) that fits your style. It’s comfortable to wear, though I’m not sure I could wear it all the time as I did notice it was there and with the rubber band, it could get a little tough to deal with at times. Still, this band is easily worn for a round or two of disc golf. I wore it on the opposite wrist of my throwing hand, so I never knew it was there. Also, it made it easy for me to click the score. I can’t comment on how this would be for ball golf as I always avoided wearing anything on my wrists when playing. I’m sure if people were used to wearing anything when swinging a club, this wouldn’t bother them. The same could be said for tennis. Those are four excellent items as it allows you to get multiple uses from one wristband. For golf, it keeps your hole score as well as your cumulative score. For tennis, keep game and set scores. Though this is something that will be a permanent addition to my disc golf regiment, the all-score mode might be the most intriguing part of this band. As the company notes on its site, there are many uses for this mode — including some other disc and ball golf functions, such as keeping putts, fairways hit or greens in regulation. Truthfully, the options are endless with that mode. Using the band is easy. There’s three buttons — two on the display and one on the side. Once you get the hang of how the watch works, it’s simple to use while playing. The key is remembering to use it. Though I don’t often do it, perusing the instructions is a smart move and messing with it for a while before taking it out will help you get used to the controls so you can work it while on the course. ScoreBand is a comfortable band that is easily used throughout a round. The best part in my eyes? It keeps your score as you go along. So if you click it after each throw or shot, you can see what you’ve done on each hole. At the end of the hole, add it to your overall score and you’ll have a clean slate for the next hole. My only issue is it can get a little confusing on how to take your round score and add it to your cumulative score. You have to hold one of the buttons down to have it do this, but in the end, once you get used to it, it shouldn’t be an issue. Though I love using my phone as a score card, the reality is it can sometimes get cumbersome to take the phone in and out of your pocket, get the screen up and type in scores. In the amount of time that takes, I’m at the next tee or shot with the score already in my watch. If you are looking for more in-depth stats, the phone apps are probably the best. But if you are out playing and just want a quick and effective way to keep your score, this really is the way to go. 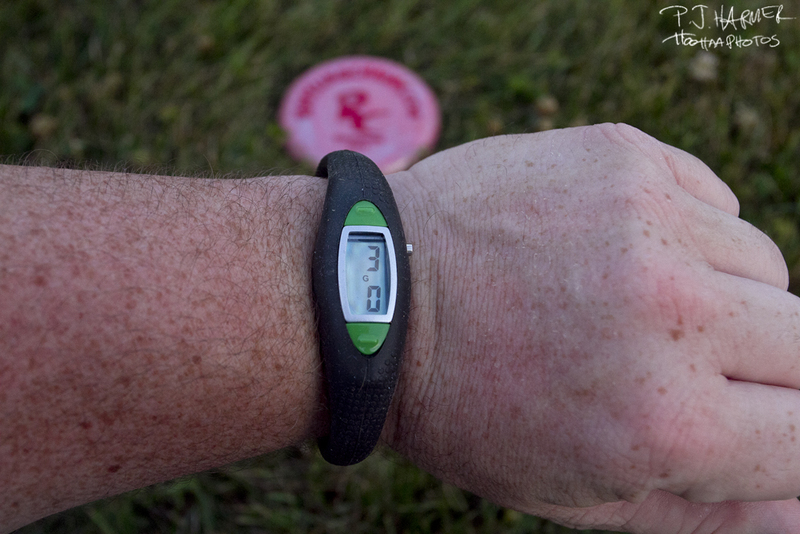 ScoreBand is $29.99, but it’s durable and something all disc golfers should consider having if they want a nice and easy way to keep score during rounds. One thing in particular piqued my interest when asked to review the ScoreBand as a method for tracking disc golf scores and statistics — I wondered if it would work for someone (namely, me) that has made a persistent effort over the past several years to remain ignorant of his cumulative score during a round. As I’ve discussed before, a primary disc golf philosophy that I espouse centers on playing disc golf in a vacuum. In a nutshell, that refers to being completly immersed with the current shot rather than letting your mind wander about things like past shots and holes, future shots and holes, other games, what’s for lunch, and especially the distraction that pertains to this review . . . total score. Keeping that in mind, I’ve yet to come across a method for recording my score among the traditional pencil-and-card and smartphone apps. I’ve trained myself to lock each shot on each hole into my memory banks without tallying the total until the round is over. When I heard how ScoreBand works, however, I thought it might be the first scoring method to allow me to record my score using a device more reliable than my own grey matter — without letting the insidious organ get in its own way. The design sets it apart from other scoring tools by being something that is worn, rather than carried, taken out and put back away repeatedly. Plus, it has a watch function, too, so you can wear it instead of your normal watch. ScoreBand’s method of keeping track of the score lends itself to my personal idiosyncrasy as much as its ergonomic design. The user hits one button for each stroke to keep score on the current hole in the upper display, then presses and holds another button to add that hole’s score to the total score in the lower display. Scoreband is a very cool concept and could help many people with disc golf scoring and many other items. In theory, this lets a player hit the buttons the required amount of time for strokes and hold it the right duration of time to advance from one hole to another without having to even look at the screens and remain as oblivious as he or she wishes to be where total score is concerned. In practice, however, I found using the ScoreBand to not be quite so simple (remember, these issues are magnified by my desire to not know my cumulative score during the round). For starters, there is the issue of when to hit the button to record each stroke. Do you do it right after each throw, or wait until the completion of the hole and hit the button multiple times? In my case, during the five test rounds I played, settling on a system was not easy. In fact, it never happened. I tried to do it throw-by-throw, then would realize on the next tee that I had slacked, requiring me to enter all the strokes on that hole at one time. And it got worse, as a few times I realized I had forgotten for two entire holes. I guess that can happen with other scoring methods as well, but having to hit a button for each stroke makes it more of an ordeal. The upper display shows the stroke count for the current hole. When the hole is complete, you press and hold a button and the hole total is added to the round total on the lower display, while the upper one resets to zero. If you forget to record a stroke, or a hole or two, there is no way to tell which hole you last recorded successfully. It’s also an issue for those who want to know how they did hole-to-hole as at the end of the round all you have is total score. The bottom line is that ScoreBand delivered in the main way I hoped it would. As a stretchy band worn on my non-throwing wrist, it was accessible and out of the way. Once I learned how to use it, I could hit the buttons without looking at the screens, enabling me to avoid knowing my score. But it either takes time to get the process down to a routine, or I’m just inept at it. Of the five test rounds I played, my total came out wrong twice. I rely on my memory-based compilation after the round is over. Since I can recall each shot in my mind’s eye, it proved my use of the ScoreBand wasn’t perfect. I don’t think the device was faulty — it was a combination of my attention span and the user interface. In January, ScoreBand was recognized as the Best Product Concept at the Professional Golf Association merchandise show. The people who awarded ScoreBand put more thought into things like that, so if you you’re like me and want a method for scoring that is handy and unobtrusive, ScoreBand may be for you. 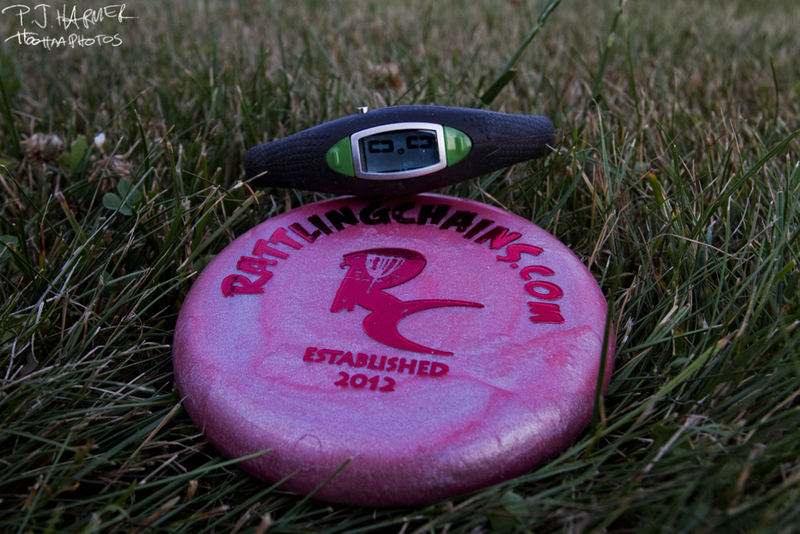 Pingback: Disc Golf Product Review: Rattling Chains & School of Disc Golf « ScoreBand: Changing the Game.